England look miles better than South Africa, according to Geoffrey. They are certainly miles ahead. Either tomorrow or Wednesday they will probably take a 1-0 lead in this series. Join us then. Bye for now. "England did well but South Africa, number one side in the world? Are you kidding? Whatever problems we have in our team we still look miles better than them." "I don't think South Africa could have had a worse day. The batting was horrible, three catches went down, Steyn got injured and they have as much chance of winning this as I have of going to the moon. There's only half a chance that they can save this because their batsmen are so low in confidence." England all-rounder Moeen Ali on Sky Sports: "Today was all about being patient and thankfully it went well. "I've worked a lot harder since I've been here on my bowling. It's paying off, but there's still a long way to go. "Maybe dropping down the order has helped. I know my role in the side quite well. I have to hold an end up or, if it's spinning, take some wickets. "I've had to change my action quit a few times. Even when I've bowled well, I've had to change. It's not easy against quality players." But Compton, Root and Taylor set up the assault that will surely come tomorrow. England will look to bash out a score, then unleash an attack on a pitch that is showing both uneven bounce and sharp turn. "The one thing for England was disappointment with Hales. He looked to have taken heed how Compon played in the first innings. He did exactly that for 26 runs but then holed out at long-on looking to smash the ball out of the ground. "Do not give it away when you get in. You have to get 70, 80, 100. I hope he learns from that." The slight negatives for England? Alastair Cook failed to get a score for the second time in the match and, after a good start, Alex Hales threw his wicket away. "What happened with Steyn was very odd. They can't do anything right, they dropped three catches off Morne Morkel, if you get your catches you might get somebody else out. I'm sorry, I don't think they've got a cat in hell's chance." For South Africa to get back into the game, they either needed something special with the ball, or some England stupidity with the bat. Neither came, and looked even less likely when Dale Steyn went off with a shoulder injury. He returned for three balls, then disappeared for a scan. We await the results. "India have done England a wonderful service. Psychologically they've done South Africa in the head. When they're batting they're suspicious and unsure." Ah yes, where would South Africa have been without Dean Elgar? The left-hander became the first South African to carry his bat since 1997 and only the second since readmission in 1991. His 118 not out got the home side to 214. "You'd think England were bowling hand grenades, and that's not the case. If you graft and work and stay in, you can make runs and the only guy who did that was Elgar." It's pretty much all gone England's way since the second ball of the day, when Stuart Broad got one to stay low for Temba Bavuma to chop on. That was the start of six wickets for 77 runs, with Moeen Ali spinning three and Steven Finn taking two with the second new ball. "It's a pretty weary, rather dispirited South Africa team coming off. Hashim Amla's keeping a low profile, he's a very quiet, undemonstrative fellow. South Africa may have needed more than that on a day like today." Bowling figures: Broad 15-6-25-4, Woakes 14-1-28-0, Moeen 25-3-69-4, Finn 15.4-1-49-2, Stokes 9-1-25-0, Root 3-1-11-0. That's it for the day, England ending day three with their hands fully around the stem of the protea. 172-3 in their second innings, a lead of 261. Even with a collpase into a heap tomorrow morning, they would be well-placed to win this match. "Amla's too quiet. You don't want someone shouting in your ear every ball, but you do want your captain to talk to you." Maybe only two overs to go now, with Dean Elgar back to deliver the first of them. Root pulls a single, with Taylor, wearing a large helmet borrowed from his dad, then continuing to nudge his way towards the close. Nathan Wake: If Root gets to 168 this innings he'll break Michael Vaughan's record for England of 1481 runs in a calendar year. Form. It's darker than a power cut in Durban now, but still we plow on to the 15:30 cut off. Not than anyone is worrying about Stiaan van Zyl's military medium. It's fair to say that the cricket has ben action-free for about an hour now. Jack Allum: I can't see England declaring before tea tomorrow. Cook is a defensive captain- he will want to guarantee they won't lose. Chris Woakes has his whites on at the back of the England dressing room. Does that mean he's padded up and ready to go as nightwatchman? Whatever Kyle Abbott urges towards James Taylor, Taylor simply dead-bats away. We're into the last 10 minutes. Tom Capes: Use the DRS to up over-rates. If the bowling side are behind the rate suspend their reviews but let the batsmen review EVERYTHING! It's been pointed out to me that Nagini wasn't in the Chamber of Secrets. Nagini was Voldemort's mate wasn't he? The basilisk was in the Chamber of Secrets? I think we've cleared that up. Away from Harry Potter, we crawl towards the close. Stiaan van Zyl trundles in, James Taylor pushes him back. What comes first? 15:30? The light? 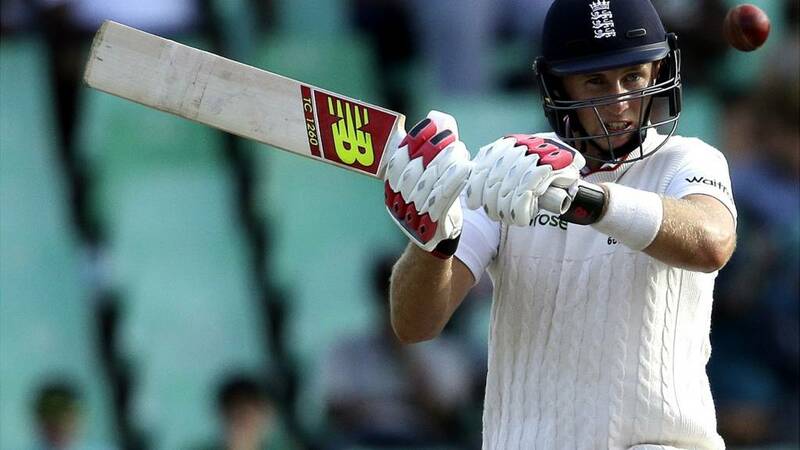 "Root now has 1,367 runs for England in Test cricket this calendar year. He's gone past Alastair Cook who was the leading scorer with 1,364." If you were to look up 'run machine' in the dictionary the chances are you would see a picture of Joe Root. His stellar 2015 continues with yet another half-century, reached with a clip off the hips for a single off Abbott. A 13th fifty-plus score in the calendar year equals the record set by Virender Sehwag in 2010. "If AB de Villiers doesn't bat in the second innings like the AB de Villiers of the last two years, it's a no-brainer, don't keep wicket. It's like playing Alan Shearer at sweeper." Still Stiaan van Zyl, with the light unable to make up its mind whether it's fading or not. Van Zyl is wobbling the ball just a touch, getting some bounce back into the waist of James Taylor. That would have got Alex Hales on the knee. JAC Wood: Um time is on our side, use it. It's a Test match why take risk? England's to lose - don't collapse. The Barmy Army have been busy. Or they've been thirsty. A giant beer snake, about 10m long, is paraded around the boundary edge. It's as if they've hauled Nagini from the Chamber of Secrets and are now showing him off as a trophy. On the pitch, Joe Root closes in on a half-century and James Taylor works through mid-wicket for four. "The administrators do nothing about slow over rates. It's a terrible blight on the game. You can see why people go to Twenty20 and 50 overs, it's the speed of it." More trundlers from Stiaan van Zyl, South Africa looking to tick down the 12 overs that are scheduled before the close of play at 15:30. It's unlikely we'll get those in even if we play for the full 30 minutes. Military medium, up and down, little action. On the plus side, the sky has brightened a little. YU HIMM FUNG: Is De Villiers trying to tell the management something about keeping wicket with those catches he has dropped? Morkel is withdrawn, replaced by Kyle Abbott as the dimmer switch is turned down yet further. Joe Root doesn't seem to be having any trouble seeing the ball, punching a back-foot drive straight to cover. We almost seem to be engaged in a phoney war. England want to make the close without further loses, South Africa just want to get off the park. Battle will resume in the morning. If they had the desire, England could really pull away now. Jack Simpson: Good batting by the England guys. Smash them tomorrow morning and give South Africa a day and half to get out. Mickey Wallis: ‏These two will score quickly. If they're both here at the end of the day we should be able to rule a loss out. James Taylor is skipping towards the off-breaks of Piedt, getting himself into all sorts of tangled positions. There's still sharp turn in the gathering gloom, while the noise levels from the crowd seem just to have cranked a notch or two. "England will be sitting pretty and then tomorrow morning can do what they want. If they bat until lunch they'll still have five sessions." It really is noticeable how quickly the light is drawing in. I think we'll make it past 15:00, but I wonder how much further we'll go. England will be looking for no further losses, setting up an assault in the morning. In the dressing room, Jos Buttler sits without a shirt on, a proper Brit abroad. Morkel gets too leggy and is clipped fine for four by Root. Dane Piedt is bowling some all-sorts off-breaks here, the frontline man not looking much better than Dean Elgar. A bit leggy, no great control of length, England allowed to milk. Shadows are lengthening. Dale Steyn is back on the field, under a sunhat at mid-on as his new-ball partner Morne Morkel kicks in. With the giant Morkel bowling to Root and Taylor, it's a bit like the big boy bowling to the younger kids. It's good stuff from Morkel, only two singles from it. It's just starting to get a bit darker. Harry Shirt: Compton and Root missed a trick there against the part time bowlers! Too many dot balls, field was out! In the celebrations, it looks like AB de Villiers took his fair share of stick from his team-mates. If I was them I'd be asking him to change his gloves. James Taylor the new man, watching on as Root twice pulls the returning off-spin of Dane Piedt. "That was one of the poorer balls that Morkel has bowled all day." "De Villiers moved his feet well and made amends for that dropped catch." This time Nick Compton has to go. AB de Villiers finally clings on and Morne Morkel at last has a wicket, from one of the worst deliveries he's bowled. It's a real strangle down the leg side, with Compton getting a faint touch of bat and De Villiers, the dropper, managing to cling on. Would you believe it! Morne Morkel is there, he can bowl and, yes, he has had another catch dropped. It's Nick Compton the batsman and again it's AB De Villiers who has butter on his gloves. Genuine edge, going between keeper and first slip. De Villiers dives with one hand and punches the ball away. Unbelievable. Conor Matchett: Replacements in Test cricket could be used to artificially increase an impact of a bowler - part of the challenge is to keep 11 fit. After a drinks break quicker than a hiccup, Dean Elgar continues. Morne Morkel is still out there, isn't he? More Afrikaans from behind the stumps, just when Nick Compton is on strike. Will the light draw in tonight? There are still 20 overs to bowl. I think we can play up to 15:30 GMT. Harry: Complete contrast to the summer where you couldn't make a sandwich without missing an entire innings. James Claybrook: England selectors need to face facts that Compton should never have been dropped in first place. Need a hard look at themselves. Stiaan Van Zyl is actually doing quite a tidy job with the ball, albeit without posing a major threat. Eight-pace run, up and down, stump to stump. A maiden to Compton, whose attitude to risk probably makes him think very carefully before getting out of bed each morning. Time for drinks. Close, very close. Compton checks a drive against Elgar, almost prodding a catch back to the bowler. Elgar takes flight to his left, the ball just evading his fingertips. Compton, enjoying his share of luck today, edges towards a second half-century on his return, while England's lead hits 200. Question. Why in this day and age are injured players not allowed to be replaced? Surely the current regulations are largely rooted in a time when only 11 players were present? Does a team effectively playing with 10 men not short change the spectator? If it could be correctly policed, could Test cricket have a replacement system? Or am I talking nonsense? Van Zyl, the other half of the two opening batsmen that are currently bowling, sends down a tidy maiden. "I can't understand why Piedt the off-spinner was taken off, he was bowling beautifully. He was looking like causing problems with every ball." Not in his worst cheese dreams could Amla have imagined a time when Elgar and Van Zyl would bowl in tandem together. Where's Morne Morkel? I'm not sure he's been seen since tea. In fairness to Elgar, he is getting some big turn - but that will only serve to encourage England in the fourth innings. JoElle: Sir Geoffrey Compton survives. I like him. He's solid. Slow, but solid. Ruairi Ward: Compton is playing a very similar role to that of Trott. A calming, steady influence to come in after wicket no.1; invaluable! With Dale Steyn nursing a shoulder problem, Hashim Amla has to call on the very part-time medium pace of Stiaan van Zyl. It's slow stuff, with De Villiers up to the stumps. Club bowling, really. Short, wide, cut for four by Compton. Behind the beard, shades and floppy hat, Amla must be a worried man. Elgar looks to strike the right note, arranging his field, composing his over in an attempt to get England to dance to his tune. Flight, slow, moon bowling, with a hint of turn. No threat, though. About as dangerous as Father Christmas. "Joe Root's doing well to bat in a sweater today - it's a bit different from Yorkshire." Kyle Abbott keeps stomping in in the extreme Durban heat. With the strength of the breeze, it must be like playing cricket in a tumble dryer. (Could you play cricket in a tumble dryer? Would probably be easier to bat than bowl.) Nick Compton pushes to the leg side and sets off, bringing up the 100. Are they out of sight yet? Surely a chase of more than 240 would be beyond South Africa? "Visually it looked like there was a deviation but nothing on the replays. Compton was immediate on that review." Yep, nothing doing there. AB De Villiers barely appealed, but Elgar was convinced. It turned, too much so to take the edge. No marks on the bat, no sound, maybe bat on pad. Compton reprieved. Where has this come from? Compton given out caught behind off Dean Elgar - it took Aleem Dar an age to put his finger up. Compton called for the review quick as a flash. For the amount of runs Joe Root scores through point, they should rename that part of the ground 'Root'. Back foot, front foot or athlete's foot, he is simply sublime square of the wicket on the off side. This time it's a drive off Abbott, a big stride and the ball thwacking the boundary after beating the dive of the fielder. "There are too many singles on offer here, South Africa need to keep the pressure on England." Dean Elgar, the only South African who figured out which end of the bat to hold, is now asked to do a job with the ball. Perhaps sore from carrying his team's batsmen, he drags the first couple of his left-arm spinners down, allowing England some freebies. It's starting to feel like England are getting away. Are you still feeling Christmassy? I hope so. I love Christmas, to the extent I want it to linger as long as possible. Do let me know of your cricketing Christmas. It could be a present, or a pic of you playing cricket by the tree. We'll prolong the festivities together. Kyle Abbott, who I think might make a good Christmas villain - Scrooge, Herod etc - is driven for three through the off side by Joe Root. "England at the moment look as though they're over that wobble they had just before tea." Ooohhhh, another touch of fortune for Nick Compton, who looks to sweep but only gets ball on glove. It balloons into the air in front of square, just beating the dive of a scampering AB De Villiers. Reprieved, Compton celebrates by driving through the off side for a couple. Helen Lewis: It won't be the last time Hales throws his wicket away like that. It's a regular occurrence at Notts & so frustrating! Peter Eastwood: Both innings Hales looked fairly solid before throwing his wicket away. He has the talent, people just need to be patient. JoElle: Criticism of Hales is a little unfair. It's been almost 2 years since a number 2 did their job of seeing off the new ball. Kyle Abbott looks hacked off, as if he is drawing on the spirit of Andre Nel. Zinc on the face, breathing hard, probably pondering the failure of his batsmen and the extra overs he will have to send down in the absence of Dale Steyn. A much better length this over, neither full or short. Single from it. Still Piedt skipping in, only a slip, cover and point on the off side. (Is three the minimum allowed? I think it is. If you've got a Wisden to hand, be a dear and look it up, please.) Root, who has played the offie too well in this match, almost offers a chance to the diving short leg. When a man in the deep comes to leg slip, Root loosens the shackles with a sweetly struck slog sweep for six. Not been playing the offie well, eh? "It's a fantastic position for England. I always thought that it would be a nice contest, England would be in the game against South Africa, but I didn't think they'd find it quite this easy." Charles Gordon, a Twitter correspondent using the hashtag #bbccricket is a wiser man than me. He points out that the South Africans speaking in Afrikaans might actually be for the benefit of Compton. Sledging in a language that he understands? We can only speculate. Abbott, a man of the cloth, looks to have learned his lesson about bowling short, but then bounces Compton and is hooked for four. Nick Compton likes a sweep, both reverse and conventional. This time he's aerially going to square leg, picking up four off Piedt. To negate the spin, Compton - usually a shuffler - is getting so far across his stumps that they need not bother with fielders on the off side. Nick Mottram: Looking at the pitch on the 1st day, you'd never have thought we'd get such drama. Big match nerves on show from both sides!! Oh, Joe Root, that is lovely. Kyle Abbott's first ball after tea, Root punches off the back foot through point for four. Tendulkar-esque. Far removed from the Little Master was the earlier dismissal of Alex Hales. Hales is currently trending on Twitter in the UK. Not a great deal of it is complimentary. There's some chat around the bat, largely in Afrikaans. I wonder if the South Africa-born Compton understands what is being said. Slip and a short leg, Compton looking to use the turn to play on the leg side. Piedt, not much taller than the stumps, skips in to start the session with a maiden. I say bright sunshine, but cloud is just rolling in to accompany the strong wind. Nick Compton is about to take strike after the break, facing the offies of Dane Piedt. The spinner might have a bit to do in this evening session. James Gutteridge: Still think Hales could be something special for England, just needs to learn how to adapt his natural game to Tests. Anthony Davison: Move Compton up to 2 and bring Hales in at 3 with the leash off. There are a potential 39 overs left in the day, but I wonder if the light will have a say - even if it's bright sunshine in Durban at the moment. The players are just dabbing the cake crumbs from their lips and heading back to the middle. An emergency fund to help flood-hit lower league cricket teams has been set up by Yorkshire. In a statement on its website, Yorkshire ask clubs in their region to send information about what is insured, which damage is repairable, long-term issues and an estimate of the bill to fix them. The ECB, which also provides advice and support for clubs affected, will help with the clean-up operation. Don't forget that Test Match Special have been looking at some of the cricket clubs that have been affected by flooding in the north of England. We've been sent some astonishing photographs. "I'm trying to think what further could go wrong for South Africa today than what has happened today." Thanks, James. Watching on, I've been wondering what is going on with this South Africa team. A dodgy batting line-up, butter fingers and a Dale Steyn fitness hokey-cokey. How curious. Time for me to take my leave and hand you back to Stephan Shemilt, who will guide you through the trials and tribulations of the evening session. "If South Africa keep dropping chances like that they'll be chasing 500. Morkel must be fuming. They've dropped the best player in the world and the man who got 85 in the first innings. Morkel will have a big bottom lip on. I hope someone takes him a nice slice of cake." Well well, how bitter will South Africa's tea taste now? They could, and should, have had England four down, and we'd be looking at a very different Test match then. England have had a few heart-in-mouth moments, but they remain very much ahead of the game. "De Villiers almost jumped too early, he was already in the air and put his hand in the wrong place. That's another let-off for England, they're riding their luck at the moment." Oh my goodness, I think South Africa have shelled another one! And it's AB de Villiers of all people! Morkel hurries Root into an ill-judged pull shot, the ball flicks a glove and a leaping De Villiers drops it one-handed. Can you believe it? "That's a nice shot from Compton, releasing the shackles a bit. I think he should be playing a few more of these." Will that reprieve free Compton up? He gets down and plays a lovely little reverse dabble behind square, that races away to the fence. "As a slip catcher it's horrible when that happens. You just want the ground to open up and swallow you. That would have been a massive catch too." "That was as easy as they come for a slip fielder, it really was catching practice." Elgar spills an absolute sitter! Compton nibbles at one from Morkel and offers the most regulation chance to second slip, but the ball clanks off Elgar's wrists and falls to ground. Elgar looks absolutely distraught, like he's accidentally taped over the graduation video with Coronation Street. Jon Dunn: ‏Boycott will be combusting in the commentary box. An opener getting caught at long on!!! Raj: Poor shot from Alex Hales. Did the hard work to get in only to give his wicket away. Joe Root is the new man and I think his fluency may help to bring Compton out of his shell. Compo survives the rest of Piedt's over. Now, what's happened here? The umpires appear to have asked for the ball to be changed. No-one's quite sure why, but Hashim Amla was in very animated discussion with the officials. A suitcase full of aged cricket balls is proffered, and Aleem Dar makes his selection. "It's as if Alex Hales just got fed up, got bored, he didn't look in any trouble." "The fielder was there but he couldn't resist the temptation to take it on." With England operating at snail's pace, something had to give and Alex Hales has perished. The ball after getting a life when he ballooned a bat-pad chance past short leg, he picks out long-on attempting to smear Piedt down the ground. The young spinner has been impressive so far in this innings. Ian Bradley: Any concerns about strike rate are missing the point, wickets in hand and blunting depleted attack the priority. Kagiso Rabada is the obvious replacement for Dale Steyn - he's currently sitting in the dug-out, feet up on the coolbox, sporting a rather funky pair of lime green shades. Looks a pretty chilled customer. Morkel squares up Hales and extracts a little bit of uneven bounce from the wicket - it's another maiden. "The off spinner's got to go around the wicket to try something different." Nice from Compton, down the track and rattled to long-on for a single. I'm still rather perplexed by that second coming of Dale Steyn - surely the South African management shouldn't have let their prize asset back on the field in that condition? "These two are batting better than most of the South Africans did." Compton survives an LBW appeal from Morkel - high and maybe swinging in too much. He then has a rather uncharacteristic swish at a wide one, and, like a man who doesn't swish at wide ones very often, he misses comfortably. Jack Allum: ‏Hales is meant to be the more positive opener. Has anyone told him...? Jack Byrne: Alex Hales does not bat like this for Notts. Why do we stop players playing their natural game? Piedt hurries through another over, with three of the runs conceded coming in byes. This is pretty sedate stuff from the England batsmen, but the again they know that South Africa are a man short and they are very probably going to get to face some part-timers before too long. "I said on the first day that a lot will depend on which fast bowlers stay fit." So, having been on and off more times than a Hollywood relationship, Dale Steyn finally departs the scene. Morkel completes the over, with a rather nervous-looking Compton getting away with a leading edge. Yes, it's not out, and with that, Steyn is off again. He is clearly in too much pain to continue and surely that's the last we've seen of him in this match. Francis makes an excellent point. After Hales's dismissal in the first innings, everyone was crying out for him to give himself a bit of time to get his eye in. So there can be no quibble with his slightly more circumspect approach here. He defuses Piedt's latest over. Francis Edwards: ‏Hales has got himself in, he's assessed the pitch and he's done the hard work.Get a score now and he has all the makings! Hales steers a single in front of square on the off side - that's the first run Abbott has conceded, off his 22nd ball. "If Alex Hales does decide to have a go at Dane Piedt then South Africa are in all sorts of trouble." Like a slow-burning period drama, Alex Hales took a while to get going, but he's beginning to find his range. He clips past short leg for a couple, then gets those long levers out and swats Piedt to the mid-wicket fence again. Tattz: He obviously needs to perform again, but what a reassuring sight Compton is coming in at 3, especially when Cook is out early. Is Dale Steyn going to have a bowl? I'm not quite sure why he's on the field other wise. Competitive instinct? Whatever the reason, it's Abbott who continues after drinks. Compton is back in his bunker: another maiden. "That was the first boundary Alex Hales has hit in Test cricket from the 70th ball he faced." Hales's strike rate was a positively Comptonesque 19 but he decides it's time to break the shackles. He gets down one knee and absolutely pings Piedt to the mid-wicket boundary with a lusty slog-sweep. But Piedt very nearly gets his revenge, hurrying one just past the outside edge to a chorus of yowls of exasperation from the close fielders. Let's all have a drink. "South Africa haven't allowed too many freebies for the England batsmen, they've asked a few questions." De Villiers gives Abbott the chance to redeem himself by throwing him the ball (gently, not hard in rage). Compton watches most of the deliveries sail by. A maiden. Harry O'haye: I can't help but think England are a better team with Compton opening and Bell at 3. No confidence in Hales. Goodness me, England nearly fritter a wicket away! Compton dabs to third man, calls for a risky second with Hales in cruise mode, and nearly collides with his partner on the way back. A better throw from Kyle Abbott and he would have been out, a fact AB de Villiers none too diplomatically acknowledges by hurling the ball into the ground in disgust. Hang on, what's going on here? Dale Steyn, who was supposed to be on his way to hospital for a scan, has just trotted back on to the park! This injury saga has got more plot twists than the EastEnders Christmas special. Hales stonewalls Morkel. "I have inside word from the England dressing room that Jimmy Anderson hopes to be fit for the next Test." "Let it rip, Pietry!" yells AB de Villiers. He's got more variations than the spinner! Delicate from Compo, waiting on a slow off-break and tickling it down to third man for three. Stuart Man Price: Gutted for Steyn. Better to face their strongest eleven and try for victory. Tom Yardley: I hope Steyn comes back on. It's not the same without his threat. There are suggestions that Dale Steyn has gone for a scan amid fears of a muscle tear. Remember there are only two days between the end of this Test and the start of the second. With the famously sedate Compton at the other end, Hales has got to take it on himself to inject a bit of impetus into this innings, which he does with a drive through the covers for two. Fall of wickets: 0-1 (Van Zyl 0), 14-2 (Amla 7), 100-3 (De Villiers 49), 113-4 (Du Plessis 2), 137-5 (Bavuma 10), 150-6 (Duminy 2), 156-7 (Abbott 0), 210-8 (Steyn 17), 214-9 (Piedt 1), 214-10 (Morkel 0). "I don't know a top six that I've ever played with that relish a third innings, even with runs in the bank." "Come on Pietros," yells AB de Villiers behind the stump. It's more imaginative than 'Piedty', I'll give him that. Nick Compton blocks out his first four deliveries. "It's a two-card trick from Piedt. The previous ball spun. Cook got a long way forward, but it's good decision. It drifted in on the breeze and hit Cook halfway up the shin. Even though he got a good stride, you've got to think it would have hit halfway up the stumps." Got him, and what an excellent bit of bowling this is! Lovely flight from Piedt, it skids straight on through Cook's defences and raps him in front of the timbers. I was a bit dismissive of Piedt earlier, but he's now taken care of England's two best batsman in this match having dismissed Joe Root in the first innings - you can't argue with that. I must say I'm not sure I agree with Dr Swann's diagnosis of Steyn's injury - he looked in a fair bit of pain to me. You may recall that during the morning session he had to fling himself to the ground to complete a tight single and it seems that may have exacerbated an existing niggle. Morkel switches ends and keeps Hales honest with a maiden. Bertie: Tiny part of me happy Steyn is injured, but really wanted to see him at his best v England. Quality bowler and cricketer. Dane Piedt into the attack to bowl some off-spin. He looks much more dangerous when he bowls a slightly fuller length, and he gets Alastair Cook shuffling back rather frantically with one that skids on. Tidy. Amla realises what a huge player Dale Steyn is in this series and if there's a time you don't really need him it's probably now, 80 behind. What a massive blow that is for South Africa, who are now down to two seamers. I'd bet good money we'll be seeing some dibbly-dobbly medium pace from Stiaan van Zyl at some stage today. Kyle Abbott completes the rest of the over pretty well. "Dale Steyn is jogging off. He looks fairly fit. He went back to his mark as if he was going to carry on, until Hashim Amla told him to get off and see the physio." Nice shot from Hales, meeting Steyn's fullish delivery with a straight bat, and a misfield from Kyle Abbott allows England to run three. Now, is Steyn OK here? A grimace of pain and the quick man clutches his shoulder. Has he twinged something? I'm not sure he's going to continue here...no, he's trudging off. Kyle Abbott is going to bowl the rest of the over. simon cosgrove: Six balls an over. Hales keeps things ticking with a nudge off his pads for one. "This third innings always the most difficult to judge for a batting team. If you lose two or three wickets that lead starts to shrink in the mind of the batting team." England's selectors have tried eight opening partners for Alastair Cook since the retirement of Andrew Strauss, trying and discarding candidates like a picky child working their way through a tin of Quality Street. In Alex Hales, have they finally found a flamboyant strawberry creme to Cook's solid toffee finger? The Nottinghamshire man is off the mark with a lovely flick to mid-wicket. Paul Stratton: Might need Elgar to get Bach-to-Bach hundreds to stay in this game. Elgan Evan Alderman: ‏Elgar was the only one who could deal with Moeen's enigma variations. Dave 大卫: Not too much pomp but very impressive in the circumstances from Elgar. Morne Morkel has dismissed Alastair Cook six times in 11 Tests and he scents blood again here. He's slanting the ball across the England skipper, looking to get him scuttling crabbily across his crease rather than confidently planting that foot to the pitch of the ball. Cook resists temptation then keeps the strike by working a single to leg. "Hales has to be so watchful of line and length - no ambitious drives. His first-innings shot will be burning away in the back of his mind. He has to show good judgement, get through the new ball." Cook scampers a single and suddenly Alex Hales is on strike against Dale Steyn. Deep breaths. Hales has a flash at a widish delivery, prompting a look of absolute disgust from Steyn, whose stare could vaporise granite. "South Africa might be thinking that they are 80 behind so they can't afford to be any further. In the first few overs you should attack, attack, attack." Morne Morkel takes the new cherry from the other end, and immediately produces an absolute rozzer, the ball pitching on off stump and just straightening past Alex Hales's outside edge. An early warning for the England opener. Email Message: Root's catch gives him 23 Test catches for the year- the joint most for an England outfielder with Tony Greig in 1974. Root's catch gives him 23 Test catches for the year- the joint most for an England outfielder with Tony Greig in 1974. Steyn misfires with a leg-side delivery which Cook gratefully flicks fine for four to get off a pair. But the radar is soon working again, as Steyn produces a perfect delivery on a fourth-stump which Cook nicks just short of third slip. "A lot of the selection decisions have question marks over them. Quinton de Kock is a frontline batsman, he's in form, and he's a good gloveman. There are specialist openers in South African first-class cricket with 10,000 runs, yet we pick Stiaan van Zyl as a makeshift opener. I'd love to know the logic behind it." "AB de Villiers' interview this morning wasn't that convincing. It left a lot of doubt. If he is struggling with his workload, it just makes the decision to make him keep in this Test even more ridiculous. My sense is that there's a few rumblings in the South African camp at the moment." South Africa's star player AB de Villiers has given a less-than-reassuring interview this morning in the wake of rumours that he could retire from Test cricket. "There are a lot of rumours flying around I hear, but for the last two to three years the only talk I've been doing is to keep myself fresh and to have a bit of rest here and there. "It's always been the most important thing for me to enjoy my cricket. It's just important to look at the schedule moving forward, that's the talk in the camp and for me maybe not to play all kinds of cricket." "If I play all the IPL games the whole season, I do get a bit tired towards the end of the season. That's the only thing that I've been talking about in the last while. To keep myself fresh and to keep enjoying the game. I love representing my country and nothing has changed."